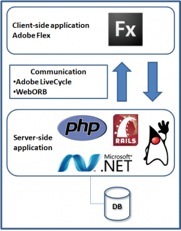 Adobe® Flex™ is an open source framework for highly efficient rich Internet application (RIA) development. Software applications built using Flex software development will apply this technology as the presentation layer in a multi-tiered model. Unlike standard HTML pages, using Flex software development will not require loading a new web page. Flex applications communicate with common server-side technologies such as J2EE (Java), .NET, Rails, and PHP. All major web server and applications (Apatch, IIS, Tomcat, JBOSS, WebLogic, and WebSphere) support Flex technologies. A software developer who is experienced with Java software development can readily learn how to perform flex application development, once the software developer understands the key differences between Java and Flex software development. 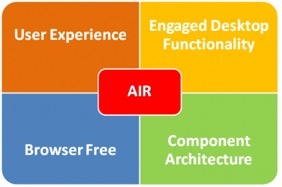 Adobe® AIR™ is cross-operating system run-time that enables developers to use proven web technologies to build and deploy rich Internet applications to the desktop. Developers can use Adobe Flash, Adobe Flex, HTML, or Ajax for building branded desktop applications.